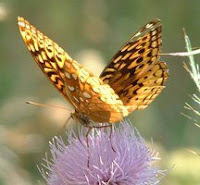 Come watch butterflies and other pollinators visiting the wildflowers. MSU entomologist Julianna Tuell will capture insects for kids to safely see up close. Learn how kids can be safe around bees. Hear about how beneficial insects help us grow blueberries, tomatoes and other foods. Kids can make a bee house (from natural materials) to take home. Saturday, June 20, 2009 at 4:00 PM. Children must be accompanied by a parent. All are welcome at a picnic potluck at 5:15. Please leave pets at home. Dr. Tuell speaks frequently about pollinators and native plants. She coauthored Attracting Beneficial Insects with Native Flowering Plants (MSU Extension Bulletin E-2973) and recently published a study that identified more than 100 native bee species on Michigan blueberry farms. We'll also have a display of nest blocks from Matt Demmon. This event is co-sponsored by Wild Ones and Natural Area Preservation. Buhr Park is located at 2781 Packard Rd. 48104. For more information call Mark at 478-1333.